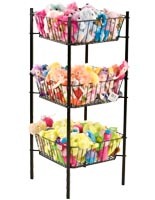 This 2 Tier Basket Stand is Ideal for Displaying a Variety of Merchandise with Double Compartments! These Large Open Top Bins are Deep and Offer Efficient Storage Space for Commercial Stores. 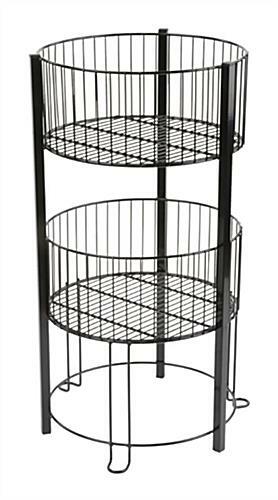 This 2 Tier Basket Stand is Constructed with Reinforcement Legs for Stability and Black Metal for Durability. This 2 tier basket stand provides a sufficient amount of space for products with large open top bins yet remains compressed in relation to the floor space it consumes. 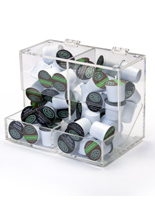 Each large open top container allows items to be elevated 10 1/2” off the floor for the consumer to access with ease. 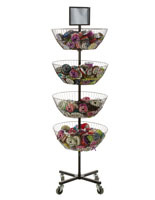 This store fixture, 2 tier basket stand provides a large storage area for merchandise. There is no lack of space to display various goods within the two levels. This stacked bin 2 tier basket stand measuring 7” deep and 16” in diameter. This stacked wire dump bin shows an abundance of merchandise and aids in increasing impulse sales. Each 2 tier basket stand that is preassembled makes set up quick and easy! This wire dump bin allows for an eye catching two layer open container display to promote browsing. 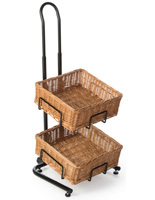 Each 2 tier basket stand, called a retail fixture, is constructed with strengthened legs for reinforcement, so there are no worries when it comes to weight capacity. The space between the bin levels is 7 1/2” which makes it easy to stock and reposition the merchandise. 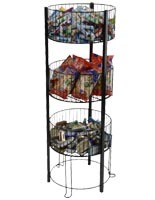 Each bin, 2 tier basket stand that is black wire steel is manufactured for optimal stability. The black metal provides a neutral backdrop for any variety of products being displayed. There is no question this steel bin fixture is a 2 tier basket stand that is stable. 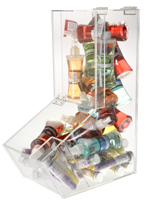 Each retail fixture offers two bins to stock a surplus of merchandise while providing an alternative shelving option. The glossy black powder coated finish coexists well with any retail décor. This 2 tier basket stand is great for bulk storage and showcasing an abundance of merchandise while taking up minimal floor space. Each preassembled wire dump bin allows for products to be stored on racks high enough for the consumer to view effortlessly. 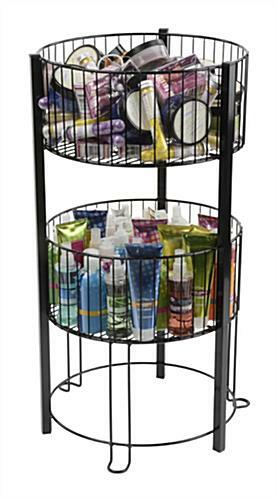 The product display, 2 tier basket stand offers a way to present an assortment of retail goods. 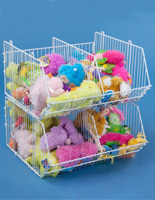 The wire dump bin unit aids in increasing impulse sales as a result of the surplus of merchandise displayed. The bin unit is a great tool for any retail environment to promote sale items, seasonal merchandise, promotional finds, or everyday steals.